If we ignore The Kiss for the minute, a real treat of a trip to Vienna’s Belvedere is the collection of 18th-century busts by Franz Xaver Messerschmidt. The Talking Heads exhibition juxtaposes his sculptures with contemporary works that share a “head” theme. It’s an eyebrow-raising experience. I’ve written about Messerschmidt’s character heads elsewhere. They’re fantastic. Unexpected. Intriguing. And 250+ years old. Which makes them ideal material for a dialogue with contemporary works on a similar theme. The Talking Heads exhibition features 12 of Messerschmidt’s busts. In addition, curator Axel Köhne takes the head as a subject in art and presents around 60 related works by ten contemporary artists. These modern works include photos, paintings, sculptures, video projections and even an alarming dark room (more on that below). I have less expertise in this area than a stork after a heavy night out with his friends, but the results are quite startling and worth the few minutes it takes to get around Lower Belvedere’s Orangery gallery. The relationship to Messerschmidt’s busts is sometimes explicit. 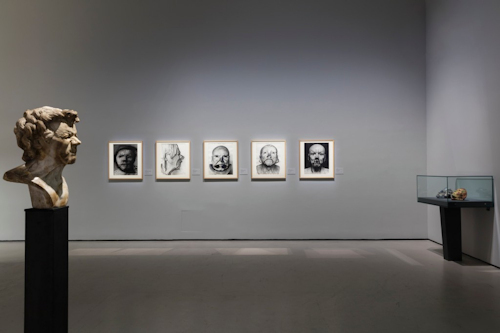 For example, Arnulf Rainer’s drawings on photos of the busts strike a suitably grotesque tone, while Mara Mattuschka’s paintings of the same seem to add a little more levity. Other works are more standalone, such as Maria Lassnig’s self-portrait paintings or Tony Oursler’s imaginative video projections. There’s certainly a darkness to many of the pieces within the exhibition, particularly in the simple, but expressive, head paintings by Miriam Cahn. A single bulb lights up a small room, illuminating the text of a report by a French doctor on attempts to interact with the head of a guillotined criminal immediately after its severing. When the realisation hits (no spoilers), it’s an eerie feeling. The Talking Heads exhibition runs from Friday, March 8 to Sunday, August 18, 2019. The Orangery opens daily and entrance is included in a ticket for Lower Belvedere (or with a Vienna Pass). See here for more details on tickets and opening times. Just follow the instructions for reaching Lower Belvedere.